There's an accessory for every occasion, and then there's an accessory that's literally for every occasion. What's better than a casual and diverse time-keeper that you can wear no matter where you are, and can be certain that you'll still look good? 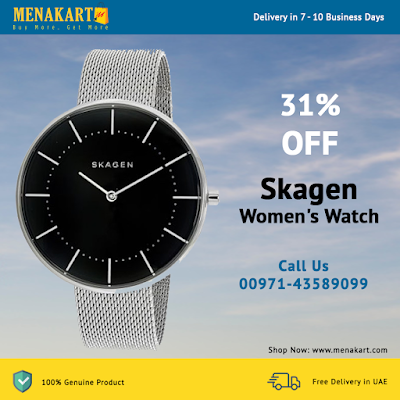 If you agree, then you'll love this Skagen Gitte watch just as much as we do. silver is just one of those colors that goes with everything, which is the first aspect of this timepiece that makes it one of our go-to casual accessories. It's glossy silver stainless steel case and silver stainless-steel band is a perfect mix of casual and classy. What makes this timepiece really catches one's eye is its black dial that stands out among the rest of its components. The dial creates an especially loud contrast against the sleek details that it displays. With silver and silver elements stick out brilliantly from the watch face, making this timepiece a daring head turner, despite its casual character. This is one that's sure to pair perfectly with any outfit in your wardrobe, from a dazzling black dress, to jeans and a silky top, to a business suit, to your gym shorts and white tee. But this watch doesn't just have good looks to offer, ladies. It's also one that will last you a long time, no matter what conditions it faces. Its stainless steel case ensures a sturdy composition and is 38mm wide and 8mmMM thick, its dial is covered with a strong mineral crystal, and it's water resistant up to 30 meters / 100 feet / 3 atm. What more can you ask for out of your everyday watch? No matter the occasion, this casual Skagen watch won't let you down, not in style nor in durability.